Okay, I admit it. It got me. Furious 7, the latest entrée in the fast car, not so fast women (the film is surprisingly family focused) franchise, and its tribute to the late Paul Walker brought more than a wee tear to my eye. However, before I go into any more detail here, full disclosure: I have never seen a Fast and Furious movie before. That’s right. Zip. Nada. Not a single one. So, take that into account before taking seriously anything I have to say. Furious 7 is, well, let’s face it: it’s ridiculous, often cheesy, over the top, clunky. In fact, one could make a sound argument that it’s really not a very good film at all. Still, it’s a ton of fun. It more than gets the adrenaline going. It has so much electric energy that if someone had a heart attack in the theater, the movie alone could get the organ pumping again. Now, that’s not to say that the film isn’t lacking. In fact, the first third is a bit of a trial to get through. This section sets up one of the major through lines, that of Deckard Shaw (an eyebrow furled intense Jason Statham) setting out to get revenge against something that happened to his brother at the hands of the Furiousi in an earlier film (what, I don’t know; like I said, I didn’t see it, but it seemed pretty darn severe to me). To get through this part, one has to experience Vin Diesel as Dominic Toretto (I don’t know who comes up with these names, but let me tell you, they’re great) trying to act and deliver dialog of a profound nature in a profound way…not the most aesthetically satisfying choice as profundity is perhaps not Diesel’s strong point (he’s much better when he’s having fun as when he played Groot in Guardians of the Galaxy and the profundity came in one syllable utterances). These early scenes are only really redeemed to any degree by a not so serious interlude of Brian O’Connor (Walker) actually having difficulty operating a car while trying to deliver his toddler to school. And that something is Kurt Russell. Yes, Kurt Russell, as Mr. Nobody (hey, I’m not making this up), enters, bestriding this somewhat cartoony world like a colossus and taking control of the movie. I mean, he’s great. He’s fantastic. He makes it so easy/breezy, you can feel the fresh air enter the auditorium. Mr. Nobody is the head of one of those ultra-ultra-ultra…ultra secret government intelligence agencies that has all the power in the world, but fortunately for us, only uses it for goodness. And this Mr. Nobody is not just all talk either. Russell also has one great scene where he dons night vision glasses and starts unloading a couple of guns on the bad guys with as much effort as waking up from a nap. But that’s not the only turn the movie takes that helps. The focus of the plot changes. Mr. Nobody will help them against Shaw if Toretto and the others will help rescue Ramsey (Nathalie Emmanuel, who also gives one of the better performances here), a hacker who has created the God’s Eye, a rather terrifying computer program that can interface with every internet run device (from phones to street cameras to ATM machines to, well, anything) and locate anyone on the face of the earth almost instantaneously (as Mr. Nobody says, it took years to locate Osama Ben Laden, but with this device, it would take only a couple of hours). And Mr. Nobody wants that for the U.S. since, well, being the U.S., we will only use it for mom, baseball and apple pie. Again, like I said, I warned you. At any rate, this is a far more interesting and intriguing story line than the Shaw one (after all, Shaw is just one of those run of the mill indestructible supervillains that you see so often these days). So the rescuing of Ramsey requires a series of incredibly arbitrary plot turns, first concerning Jakandem, the terrorist who has abducted her (Djimon Hounsou—the only one in the movie who gives Russell a run for his money in the acting area) and a second one requiring crashing the birthday celebration of a wealthy Middle-Eastern businessman. And believe me, even though these set pieces may be arbitrary, dag nab it, they are still pretty darn neat. It all ends up with a showdown in L.A., which did bother me a bit at first. In the earlier scenes, things were managed in such a way as to not endanger any “civilians”. But here our heroes manipulate events such that the hoi polloi (that’s you and me, bub) can’t help but be put in harm’s way. At the same time, everyone involved here does an excellent job of keeping damage to the city at a minimum (unlike the recent comic book outings that reduce redux New York City to little more than rubble) while also keeping casualties to a minimum (I mean, you have never seen the streets of L.A. so bereft of traffic). So, all’s well that ends well with the possibility for another entry in the franchise. And then there it is, the Paul Walker tribute with a very, very, very touching goodbye scene between Toretto and O’Connor that doubles both as a goodbye for the characters and a moving metaphor for saying goodbye to the actor. With the usual suspects taking up the other roles (Michelle Rodriguez, Tyrese Gibson, Ludacris, Dwayne Johnson, Gal Gadot) and Jordana Brewster as O’Connor’s wife—finally, a helpmate whose reaction to the situation isn’t, “Honey, don’t go out and save the world, stay home with me and the kid”, but is, “I know it’s got to be done, just come back to me”. The screenplay is by Chris Morgan, and the direction, which is often more editing than anything else, especially of the I Want My MTV kind, is by James Wan. 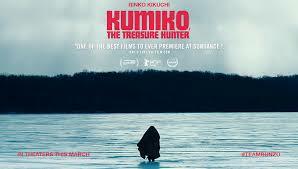 The new independent film Kumiko, the Treasure Hunter, is about an isolated young woman, Kumiko, living in Japan who sees the movie Fargo and takes it seriously when it says it is based on a true story. So she sets out for America to find the stash of cash that Steve Buscemi left in the snow by a barbed wire fence with only a red ice scraper to show where it is. How you feel about the movie will depend on whether you see the central character as one of those odd ducks who does quirky things in indie movies, or whether you see her as someone with deep emotional issues on the verge of becoming mentally unstable. If the first, then you might warm to this little film. If the latter, a category I must confess I fell into, then the film might come across as a bit too exploitive, leaving you wondering just what the point is and why you are watching someone mentally self destruct. I mean, yes, it is a clever idea, that of someone taking the Coen brother’s movie too seriously when it says it is based on a true story (of course, one might wonder why Kumiko never watched the television series which actually tells you what happened to the money and that it is no longer there to be found, but let’s not be snarky). And at first one does sympathize with our embattled heroine, surrounded as she is by fatuous workmates, a feeling of isolation, and a self-important boss who is at times almost sociopathically cruel. At the same time, it feels as if it takes way too long for the story to really get started. And the movie never really picks up any real energy. It all feels as enervative as Kumiko’s personality. And the ending doesn’t really leave one with that much of an emotional resonance. However, I must say that the movie is extremely well made. While I might feel that the screenplay by brother team David and Nathan Zellner (who both appear in the movie) is a bit lacking, David Zellner’s direction is strong and first rate. He seems completely in control of everything and the cinematography by Sean Porter is often quite stunning. With Rinko Kikuchi (nominated for an Oscar for Babel and recently seen in Pacific Rim) as Kumiko. She gives a very empathetic performance.